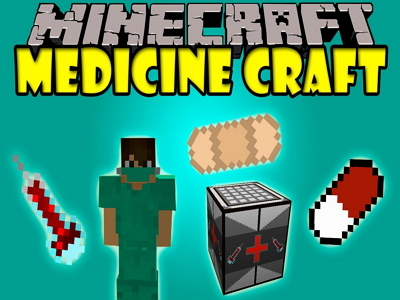 The Medicinecraft Mod for Minecraft allows players to create a crafting table that they can use to craft medication and medical equipment. These can be used in PVP and have amazing effects! In addition, you can create armor that is more at home in the hospital than the battlefield, and the mod designer has added some hospital equipment. Many of the items that you can get out of the crafting table mimic the effect of potions, but some are absolutely unique. Not only do they provide effects, but some are crafted from pre-existing recipes. The surgical mask, for example, has the same basic recipe as the iron helmet. So I guess it’s an iron surgical mask. But it’ll protect you from germs.